The third “International Workshop on CdTe Materials and Solar Cell Application” took place on 29 August 2017 in Hohhot, the capital of the Chinese province of Inner Mongolia. This year the workshop, which attracted more than 100 delegates from the world of industry and science, was organized by the Chinese Academy of Sciences and hosted by Inner Mongolia University as part of the 17th China Photovoltaic Conference. 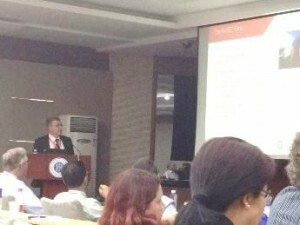 CTF Solar CEO Dr. Michael Harr took advantage of this meeting with a large number of CdTe experts from around the world to share his personal perspective on the history of CdTe solar module production in a short talk entitled “From ANTEC Solar to CTF Solar, From Arnstadt to Chengdu”.